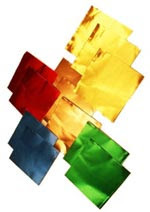 10 sheets 12.5cmx12.5cm Assorted craft foil which is great for all types of craft work including embossing using Spellbinders dies. Each roll is coloured one side and silver on the reverse. With all 5 colours in this pack including 2 x red, 2 x green, 2 x blue, 3 x gold & 3 x copper, there's plenty of choice for all your creating. This foil can also be dry embossed using an embossing tool or you can cut and shape it using scissors and punches. 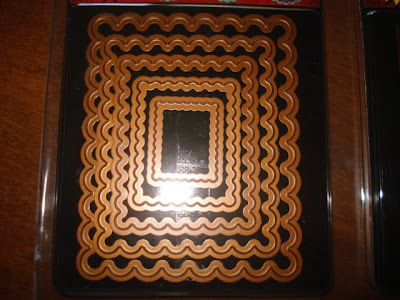 Tan Emboss Pads contains Natural Rubber Latex (NRL) which allows you to control the depth of embossing when working with foil and cardstock. 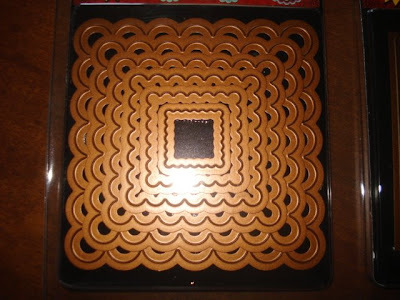 This 12x12 inch pad can be cut to the size of your stencil to get rid of the "lines" around the edge of the embossed design. 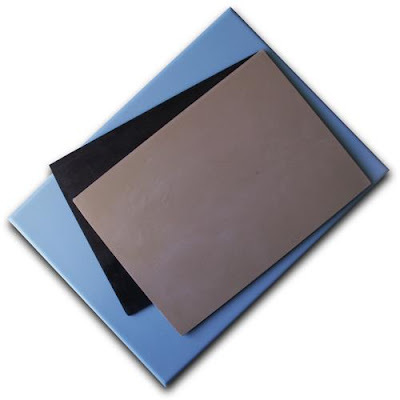 2 x 15cmx20cm Thick White mats White replacement mats for use with the Wizard Die Cutting Machine. 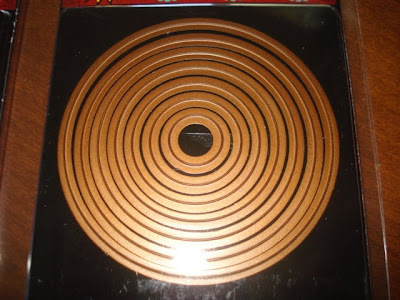 Two mats in each pack measuring 15cmx20cm approx. 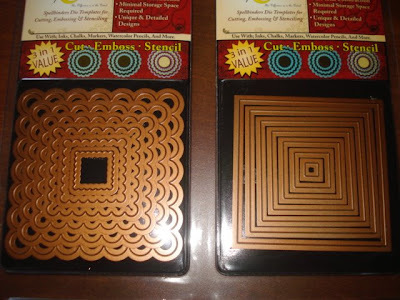 The Charm Embossing Kit allows crafters to emboss any flat charm into foil or cardstock. 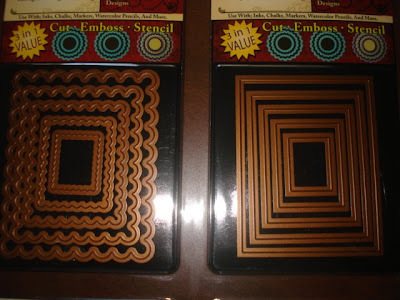 It also expands Wizard capabilities by allowing you to emboss and texturize with non-Spellbinders Texture Plates. 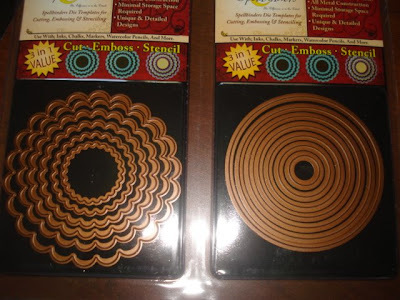 This set of 6 concentric dies is so versatile and one of Spellbinders' most popular die template sets. It's a go-anywhere, do-anything kind of shape. Part of the Nestabilities line, the dies cut nested shapes with a ¼" mat around each layer. This makes cutting, matting, framing and embossing simple and beautiful. 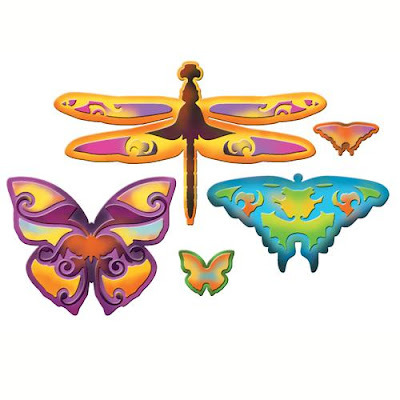 Approximate Image Sizes: 1 3/8" diameter, 1 7/8", 2 3/8", 2 7/8", 3 3/8", 3 7/8"
This collection of delicately embossed dragonfly and butterflies and will bring elegance and charm to any card, layout or altered item. Use the reverse stenciling technique on these to bring out another dimension in their look. 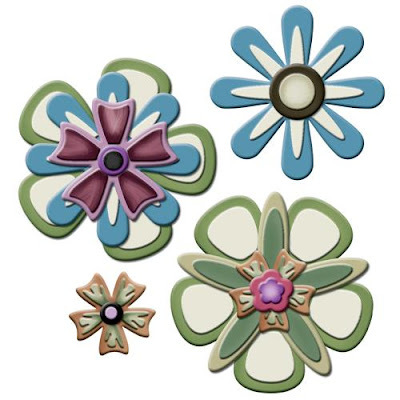 The Die Template that started a series of mix and match flower collections. Only Mother Nature has more options for creating her gardens. 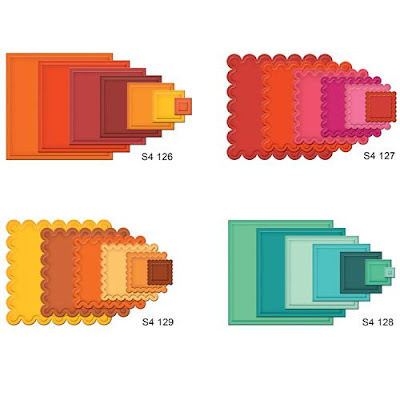 Cut the Die templates from several different papers and layer a variety of styles for stunning results. Tiny Flower: 3/8". Small Five Petal: 7/8", Large five Petal: 1 1/4", Eight Petal: 1 3/4". Five thin petal: 2". 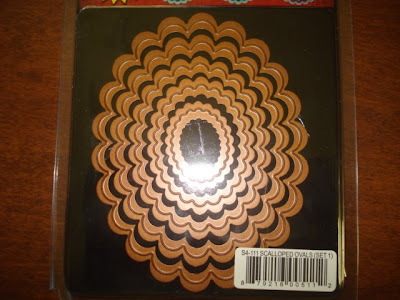 Five "Paddle" petal: 2 1/8"
One of Spellbinder's all-time top dies. 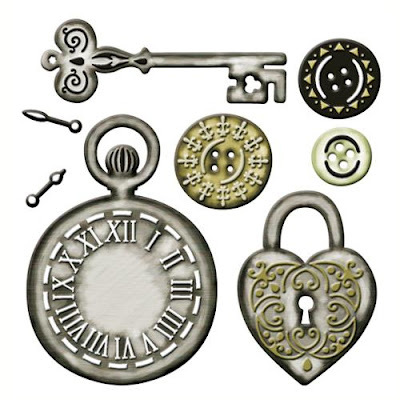 This vintage collection of images includes a pocket watch with hands that can be added, 3 delicately embossed buttons, a skeleton key and heart locket. These images will find their way onto myriad projects from dainty little girl pages to tribute albums. This is a "gotta have it!!" 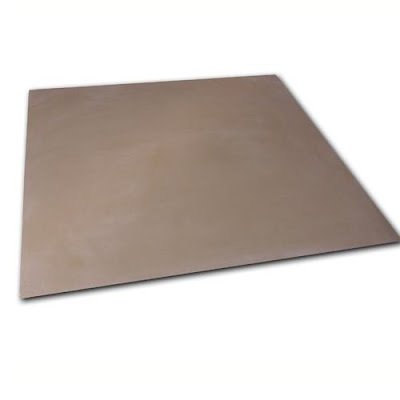 Approximate Die Template Sizes: Key: 2 5/8" x 7/8". Pocket watch: 2x2 3/4". 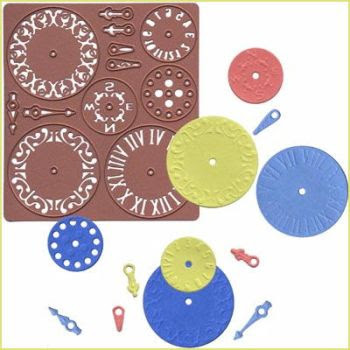 Buttons 5/8", 7/8" and 1" diameters, Locket: 1 & frac12x2", Watch hands: 1/8"x &frac12"
A foundational die template to be sure. The Scalloped Rectangles work overtime on cards, layouts and altered items. This die coordinates with S4-132 Classic Rectangle, Large. Approximate Image Sizes: (Scallops are measured from inside of points on each side) 1 1/4x 1", 1 7/8 x 1 1/2", 2 1/2x 2", 3 x 2 3/8", 2 3/4 x 2 7/8"
This Nestabilities set is perfect for card making and scrapbooking. Stamp on one to feature on a layout or mount another die cut on one for a card. Combine the plain shapes and scalloped ones for even more versatility: frames, boxes, the list goes on. This set coordinates with the Classic Squares, Large, (S4-128) allowing for plain and embellished squares at sizes seen below. To have the most intricate offering, why not get the Nest-02, allowing for concentric frames at ⅛". 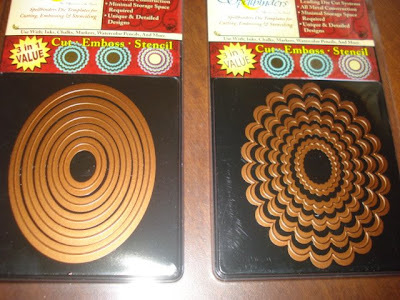 This set of Standard circles coordinates with all the "Large" sets of any of the embellished edge Nestabilities Circles. In other words, these straight edged shapes can be embellished by the Classic Scallops, Petite Scallops and Pinking edges. Cool, hugh? 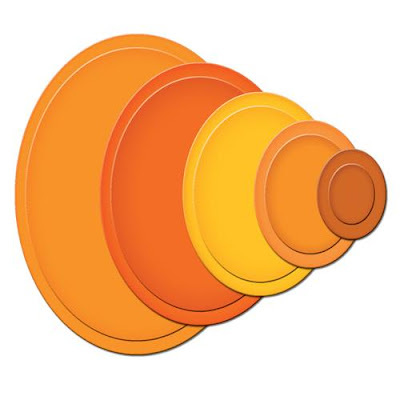 This set measures 3¾" in diameter and reduces ¼" in radius with each of the seven die templates included. It coordinates with Classic Scalloped Circle, Large (S4-124), Petite Scalloped Circle, Large (S4-115) and Pinking Circle, Large (S4-171). 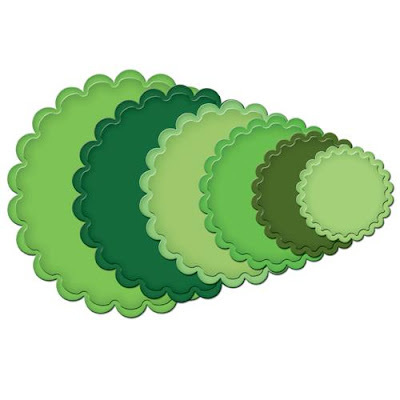 Approximate Image Sizes: 7/8" diameter, 1 3/8", 1 7/8", 2 3/8", 2 3/4", 3 1/4" and 3 3/4"
A great set of scalloped ovals to enhance a collection. 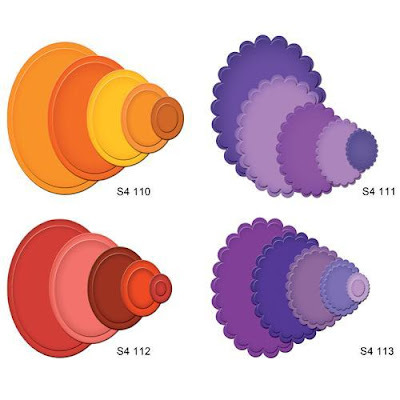 This five die concentric set features a medium profile scalloped oval and is great for card sentiments, journaling or embellishment mats. It coordinates with Classic Oval, Small (S4-112). 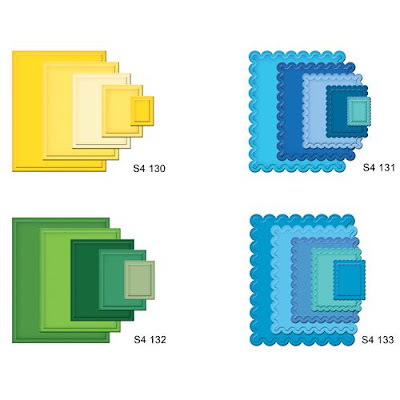 Approximate die sizes for five images: 1x3/4", 1 3/4x 1 1/4", 2 1/4"x 1 3/4", 3x 2 1/4", 3 3/4x 2 3/4. A great set of scalloped ovals to enhance a collection. 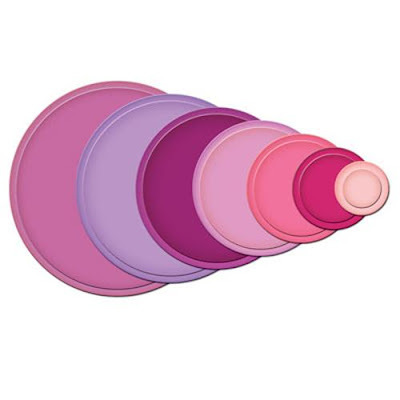 This five die concentric set features a medium profile scalloped oval and is perfect for card sentiments, journaling boxes or embellishment mats. It coordinates with Classic Oval, Large (S4-110). For a 20% savings, buy the Classic Oval collection, see Nest-001. 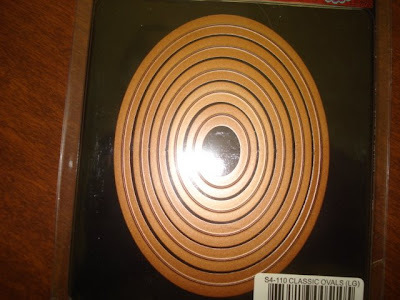 These dies are 3” x 4” and scale down at ¼” from there. Approximate die sizes for five images: 1 x 3/4", 1-3/4 x 1-1/4, 2-1/4 x 1-3/4, 3 x 2 1/4, 3-3/4 x 2-3/4. This straight edge oval, with a medium profile, is an elegant shape and perfect for card making, home decor or scrapbooking projects. It coordinates with Classic Scalloped Oval, Large (S4-111). For added versatility and a savings bonus, purchase the Classic Ovals collection, Nest-001. These dies are 2.75” x 3.75” and scale down at ¼” from there. Approximate sizes of Die Templates in five images: 1 x 3/4", 1-3/4 x 1-1/4, 2-1/4 x 1-3/4, 3 x 2 1/4, 3-3/4 x 2-3/4. 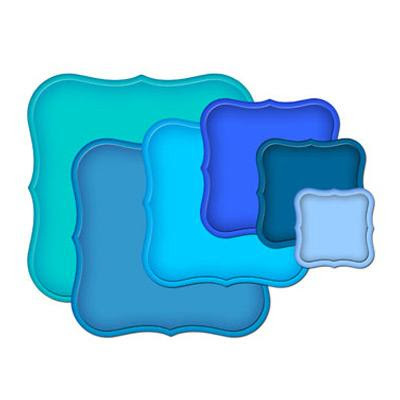 Rectangle sets, featuring Classic Rectangle Large and Small and combined set featuring Classic Rectangle Scallops Large and Small. 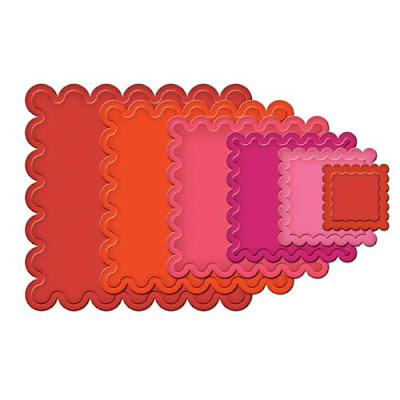 These dies are 3.2” x 4” and scale down at ¼” from there.This die set contains two sets of straight-edge Die Templates: S4-130 Classic Rectangle, Small (5 dies), S4-132 Classic Rectangle, Large (5 dies) And two sets of embellished-edge shapes in large scallops: S4-131 Classic Scalloped Rectangle, Small (5 dies), S4-133 Classic Scalloped Rectangle, Large (5 dies). 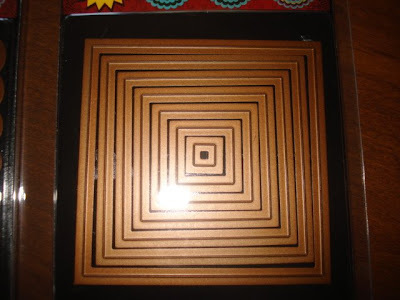 This Nestabilities set contains squares with a large scallop. Purchasing the set is a money saver! These dies are 4” x 4” and scale down at ¼” from there. 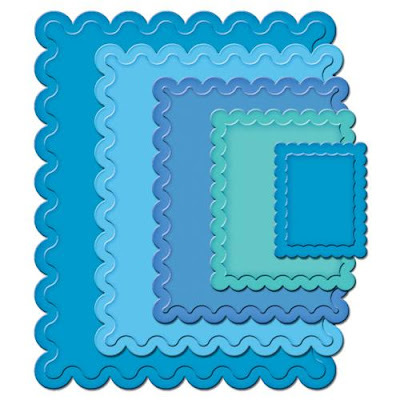 Included are 2 straight-edges sets: S4-126 Classic Square, Large (7 dies), S4-127 Classic Scalloped Square, Large (6 dies) And 2 embellished-edge sets with large scallops: S4-128 Classic Square, Small (7 dies) S4-129 Classic Scalloped Square, Small (6 dies). Oval sets, featuring Classic Oval Large and Small and combined set featuring Classic Oval Scallops Large and Small. These dies are 3” x 4” and scale down at ¼” from there. 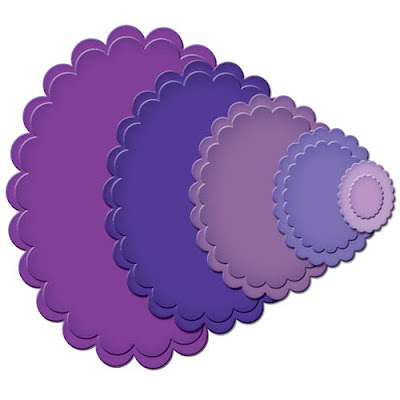 A versatile set of oval dies that you will reach for again and again. 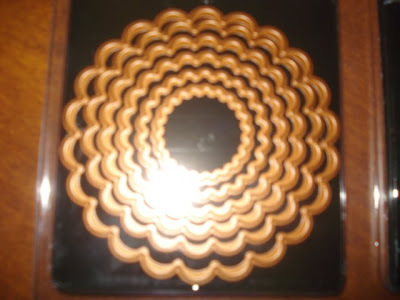 Layer the scalloped and straight edges for interesting and appealing designs. The collection saves $20 over buying the dies individually. 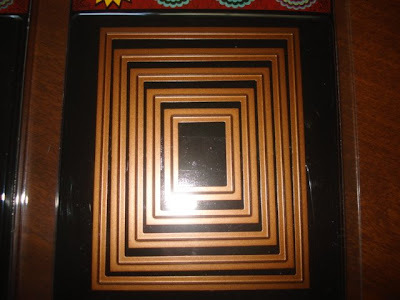 The Spellbinders Dies will work with other die cut machines. These dies take very little storage space. 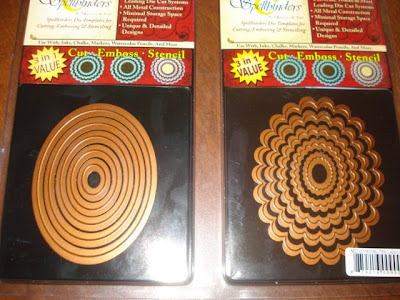 The Spellbinder metal dies are the perfect die for cutting, embossing and stencil work. 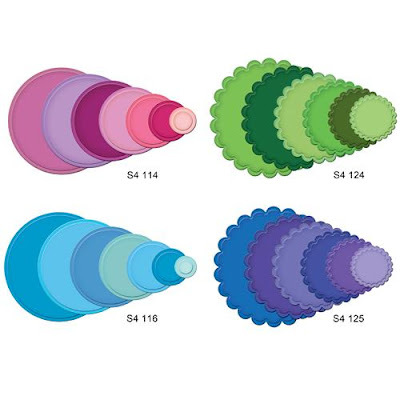 It includes 2 straight-edged shape sets: s4-110 Classic Oval, Large (5 dies), S4-112 Classic Oval, Small (5 dies). 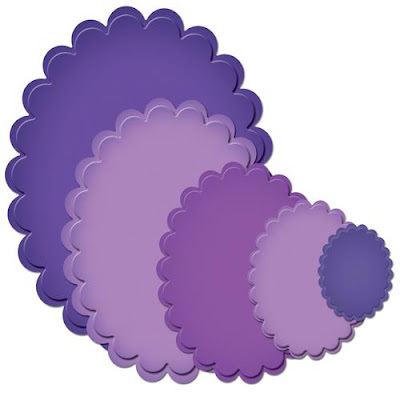 And 2 embellished-edge shape sets:S4-111 Classic Scalloped Oval, Large (5 dies), S4-113 Classic Scalloped Oval, Small (5 dies). Link exchange is nothing else but it is simply placing the other person's blog link on your page at appropriate place and other person will also do similar in favor of you. RnyUks The way in which cheap snuck [url=http://montresguesscollection.webnode.fr/]montres guess[/url] YbsJbv [url=http://sacguesssoldes0.webnode.fr/]solde sac guess[/url] CwxBys you [url=http://sacamainguesspascher.webnode.fr/]sac à main guess pas cher[/url] CvdNjf Upgrade your current [url=http://bottesisabelmarant.webnode.fr/]bottes isabel marant[/url] in about half the time without having to spend more cash! EgaHth The ways[url=http://sneakersisabelmarantoutlet.webnode.fr]isabel marant outlet[/url] Helped Me Turning Rich And Famous BriWef ZziGhe [url=http://michaelkorssacamain.webnode.fr]sac a main michael kors[/url] ZfqXvi BtgLsx [url=http://isabelmarantbasketsenligne.webnode.fr]isabel marant baskets solde[/url] XtmRgm Renovate your own personal cheap [url=http://www.burberryoutletscanada.ca/]burberry bags[/url] within about half the time without spending additional money[url=http://www.burberrysoutletcanada.ca/]burberry sale[/url] UlfLyu! Bella Blvd - NEW BRAND!!! Elle's Studio Journaling Tags - NEW BRAND!! !